Nestled on a private island, the Boutique Resort Bikendrik Island is an all-inclusive eco-resort in the northern Majuro Atoll of the Marshall Islands. Amidst 3.6 acres of land, the retreat occupies the site of a former colonial coconut plantation. Providing accommodations for just three couples at a time, and surrounded by crystal clear waters and coral reefs, the property is an idyllic destination for honeymooners and those seeking a secluded, romantic retreat. Read more about the resort below the photo. Guests of the resort fly into the Amata Kabua Airport in Majuro, where a shuttle takes guests to the jetty. From there, visitors board a private boat for a 45-minute trip along the atoll through scattered, mostly uninhabited islands. Continue reading below the boat photo. Once guests arrive, they spend their time on the island in either one of two bungalows or a beach house. Featuring traditional colonial styling, accommodations have private en-suite bathrooms, exclusive works-of-art, antiques, daily turndown service, and complimentary minibars. Fresh fruits are delivered daily, and all-inclusive Cordon Bleu dining is available in the main house. Read more below the photo. Surrounded by coral reefs, the eco-resort offers guests a variety of water-focused activities such as snorkeling, scuba diving, kayaking, and fishing. There's aslo a well-stocked library on the island, and visitors can schedule in-room massages and beauty treatments. Set along the soft white sands of a turquoise-hued lagoon, Constance Belle Mare Plage is a luxury resort providing a high-end setting in Mauritius. 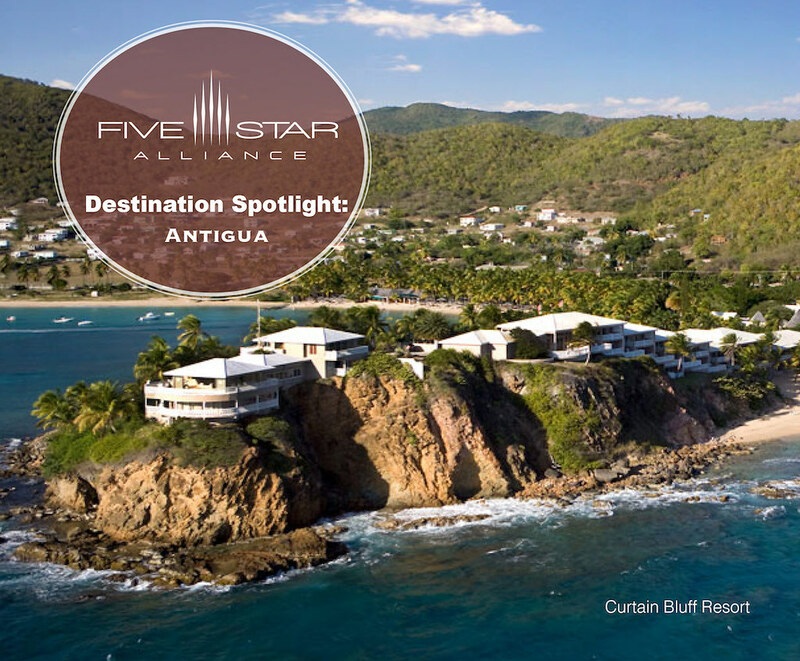 Offering beachfront luxury, the recently renovated resort has two golf courses, a full-service spa, kids' club, and four swimming pools, making it an ideal retreat for travelers of all ages. Read more about the resort below the pool photo. For accommodations, guests can choose from 104 Prestige Rooms, 149 Junior Suites, 6 Deluxe Suites, 18 Villas, or the Presidential Villa. Facing the Indian Ocean, accommodations are located in buildings of no more than three floors. Featuring modern island styling, all rooms and suites have furnished terraces or balconies, air conditioning, TVs with satellite channels, minibars, Apple mac minis, safes, desks, sitting areas, and laundry facilities. Within the rooms there's luxurious bathrooms with showers, bathtubs, and water closets. Continue reading below the photo of the Deluxe Suite. Surrounded by tropical gardens, the resort's beach is protected by an offshore coral reef, providing visitors with an ideal location for snorkeling, water sports, and swimming. There are catamaran sundowner cruises, underwater walks, and parasailing experiences, plus cooking classes where guests can learn to make local cuisine. In addition, the resort has four floodlit tennis courts, table tennis, French bowling, mini golf, and two 18-hole championship golf courses, all with complimentary access for resort guests. Surrounded by crystal clear turquoise waters on its own secluded island, Constance Moofushi Maldives is a luxury resort and diver's paradise. Situated on the South Ari Atoll, considered one of the best diving spots in the world, the property offers an idyllic location for diving along the migration route of manta rays. There are 32 dive sites within 30-minutes of the all-inclusive resort, and guests can also explore the waters via a traditional Dhoni, or from above in a sea plane. Continue reading below the resort photo. Featuring Crusoe Chic Barefoot Elegance combined with the Constance Hotels highest standards, the all-inclusive property offers guests an island paradise with as little or as much seclusion as desired. The all-villa resort has 24 beach villas, 56 water villas, and 20 Senior Water Villas, each with air-conditioning, ceiling fans, sitting areas, wooden terraces, minibars, and luxury bathrooms. Read more below the photo of the Senior Water Villa. For the ultimate retreat, Senior Water Villas provide an exclusive over-water setting with an airy design. Featuring additional space, the Senior Water Villas have luxe bathrooms with outdoor bathtubs, dual vanities, and separate showers. There's also spacious wooden terraces with steps leading to direct water access for a leisurely swim directly from one's villa. Read more below the photo of the Senior Villa Living Room. Within the Senior Water Villas there's also LCD TVs, mac minis with iPod, CD & DVD connections, as well as coffee facilities, and minibars. In addition to high-end accommodations, the Constance Moofushi Maldives offers gourmet dining at two on-site restaurants, including the MANTA Restaurant with a sand-floored dining area as well as as an over-water dining room with an international menu and wine cellar. There's also a spa for rejuvenating treatments, and a variety of activities such as snorkeling, dolphin watching and sunset cruises, as well as Maldavian-style fishing excursions. Overlooking the azure waters of the Indian Ocean, Constance Tsarabanjina is an all-inclusive luxury resort offering 25 beach villas. Set within a sacred islet where the tomb of the Sakalava kings of the Mitsio islands is located, Tsarabanjina is one of the islets of the Mitsio Archipelago. Situated in the Northwestern part of Madagascar, the region is fringed by white sand beaches, coral reefs, lush vegetation, and array of tropical birds. Continue reading below the photo. The intimate eco-retreat provides visitors with a laid back atmosphere. The property's 25 villas offer a barefoot chic environment where guests can have Robinson Crusoe-style experiences on a Madagascar island without sacrificing all of the modern comforts. The villas have ecological thatch roofing, furnishings in simple tones, private terraces with two deck chairs, minibars, and bathrooms with showers and separate toilets. Read more below the villa photo. The resort is surrounded by calm seas, providing guests with a variety of experiences in the natural surroundings. There are guided nature walks and snorkeling excursions, private cruises, and the Akio Diving staff is available for underwater excursions. For dining at the all-inclusive property, gourmet Malagasy specialties are served in a sand-floored restaurant with a premium drink selection. Ahhh...winter. As charming as sweater season and relaxing by a warm fire can seem, at a certain point, it's time for an escape. But with all the hurricanes that happened in 2017, it can be a bit daunting to determine what Caribbean destinations are open and ready for visitors. To make it a bit easier, we've gathered five of our top Caribbean resorts picks for idyllic winter escapes so you can relax in the sunshine instead of trying to stay warm in the more than brisk winter weather. Located in the Southern Caribbean on the island of St. Lucia, Jade Mountain Resort provides panoramic views of the island's Piton World Heritage Site and the Caribbean Sea. The exclusive resort-within-a-resort concept by Anse Chastenet, features bold architecture with open-concept designs linking bedrooms and living areas with infinity pools, providing viewing platforms to take in the island's natural beauty. Recognized as one of the world's most exclusive resorts, The Ocean Club, A Four Seasons Resort, formerly the One&Only Ocean Club, offers an iconic location in the Bahamas with recently refurbished accommodations, restaurants, and public spaces. 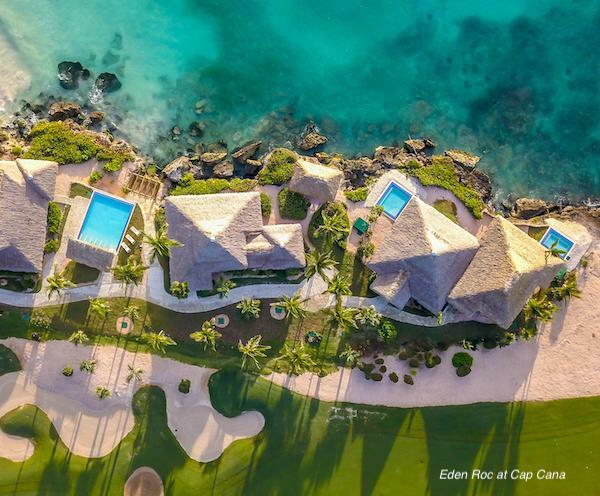 Set along a 5-mile stretch of beach, the resort provides a laid-back Bahamian lifestyle amidst Versailles-inspired lawns and gardens with three swimming pools, six tennis courts, Balinese-inspired spa, kids' club, and access to the adjacent Tom Weiskopf-designed Ocean Club Golf Course. Located on the island of Curacao, about 35 miles from Aruba, Santa Barbara Beach and Golf Resort Curacao is set amidst 2,000 acres. Within the resort guests can play tennis, partake in a variety of watersports, lounge poolside, hike or bike amidst rock formations, caves, and caverns, or go yachting from the resort's marina. For dining, SHORE provides open-air fine dining with sea views as well as the Jun's at Shore with sushi specialties, Medi Restaurant offers international cuisine, and SPLASH Pool Bar & Grill serves casual fare. Providing an all-inclusive setting for couples Sandals La Source provides an exotic setting on the "Spice Isle" of Grenada, which is one of the world's only producers of Nutmeg, which is infused in many dishes and products on the island. The island is also home to the world's first underwater sculpture park, and the resort offers four unique villages with a variety of suites and villas, including some with swim-up access and butler service. Situated along the world-famous Grace Bay Beach, The West Bay Club Turks & Caicos is a luxury boutique resort. Offering an array of amenities, guests can enjoy complimentary bicycles and watersports, lounge by the beach or pool with personalized service, relax at the Anani Spa, entertain young travelers with supervised children's programs, workout at the fitness center, or experience fine dining at Drift, an open-air restaurant on the shores of Grace Bay Beach. Five Star Alliance Perk: Guests booking through Five Star Alliance receive a $100 Resort Credit per room, per stay, plus a welcome fruit and water amenity. Featuring an idyllic setting El Dorado Royale, by Karisma, is an adults-only all-inclusive resort designed to help guests relax and unwind while on vacation. There are world-class restaurants serving cuisine by renowned chefs, as well as personal concierges and bars pouring top shelf cocktails. Twice a month there are culinary series showcasing visiting chefs from around the world, as well as fitness classes, dance lessons, and wine tastings. The beachfront property offers a wide array of services and activities, discover 5 of our favorite activity options below the resort photo. Every Friday morning the resort hosts a casual 5K Race through the property's mangroves, jungles, and beachfront. Guests can tour the resort's 76,000 square-foot hydroponic greenhouse to see how the resort's fruits and vegetables are grown sustainably on-site. Explore the property's jungles, fruit orchards, cenote caves, and crystal pools while saddled up for a chance to see monkeys and tropical birds. Sip house-infused tequilas as well as expertly selected premium tequilas ideal for sipping. See rare coral and tropical fish while snorkeling through the waters just off the resort's beaches. Read more about the resort below the photo. In addiition to the activities listed above, the property has an aqua gym, archery, rifle shooting, cigar rolling lessons, ranch tours, and cooking classes. The Gourmet-inclusive resort has 15 restaurants on-site, as well as six pools and two full-service spas. 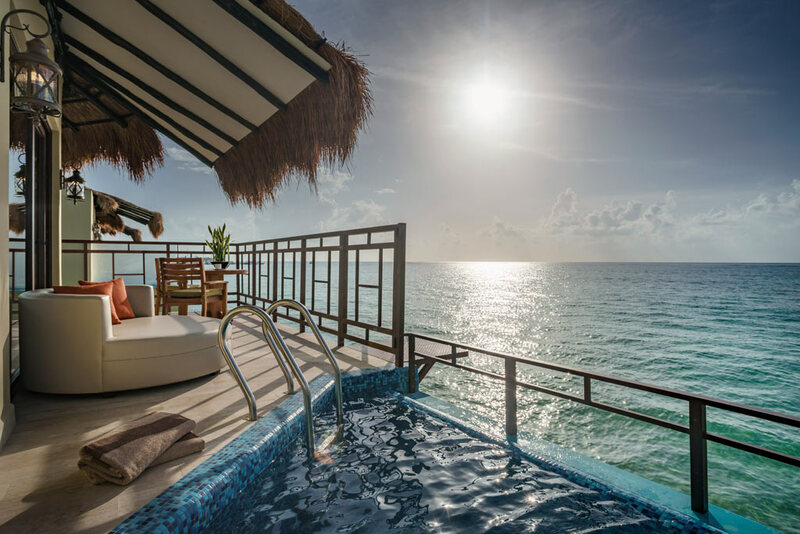 Ideal for couples, honeymooners, and weddings, the all Jacuzzi-suite resort is set along the Caribbean Sea in the heart of Riviera Maya. 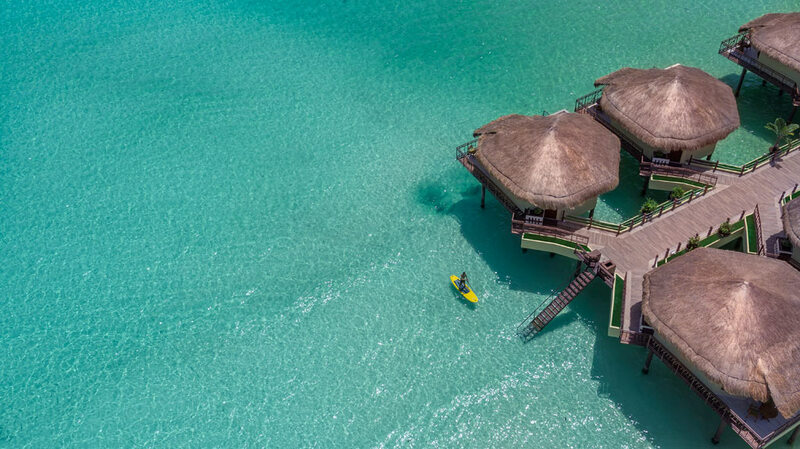 Set just off the white sands of Maroma Beach, the new Palafitos Overwater Bungalows at El Dorado Maroma provide a unique escape. 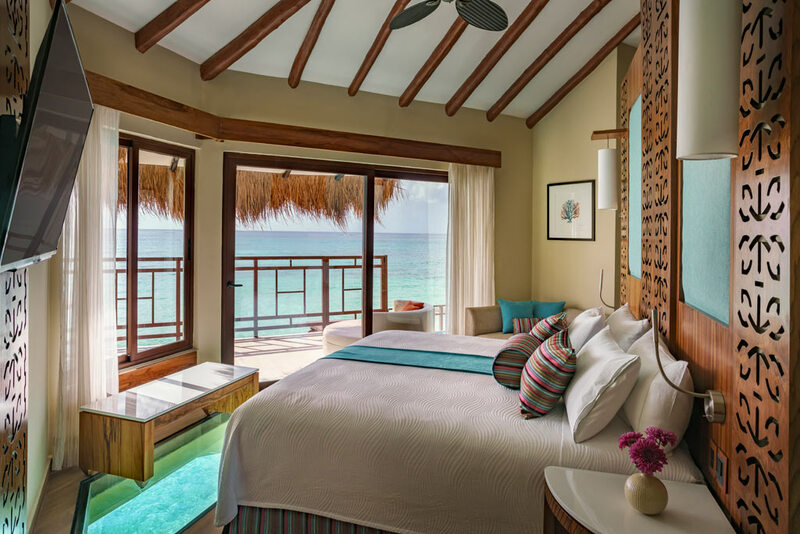 Surrounded by turquoise waters, the recently opened luxury bungalows have glass bottom floors, private infinity pools, oversized decks with wooden lounge chairs, snorkeling equipment, and ladders providing direct access to the ocean. Read more below the photo. Providing a romantic and private setting within the adults-only resort, the Palafitos have "Aguas del Amor" outdoor showers, and indoor jacuzzis for two. There's also personal Majordomos to cater to guest's specific needs and requests, as well as a premium selection of alcohol and snacks. Plus, visitors staying in Palafito Overwater Bungalows for five or more nights can schedule an exclusive chef-prepared moonlight dinner on their own private terrace. Read more below the photo. 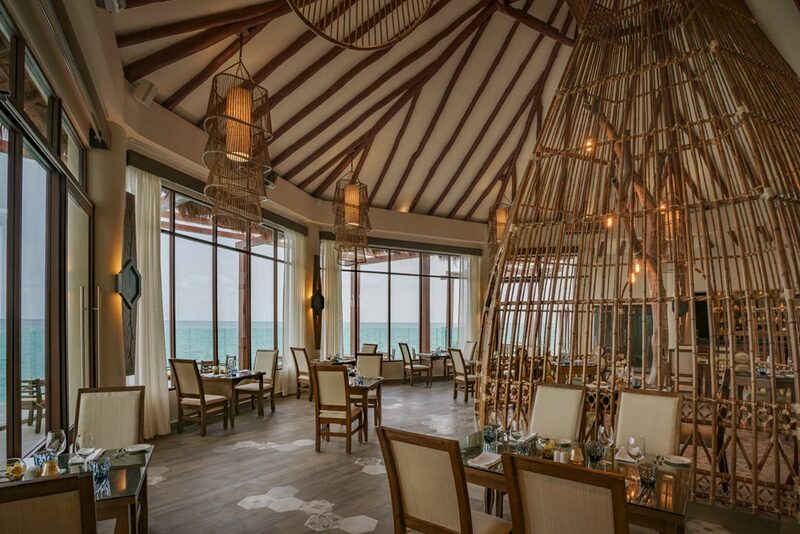 Within the all-inclusive resort there's also the Overwater Grill & Wine Bar with glass floors and an international grill menu for breakfast, lunch, and dinner. Continue reading below the photo. El Dorado Maroma, a Beachfront Resort by Karisma is an adults-only property with an intimate design, where the beach, pools, restaurants, and spa are a short stroll from one another. There are six dining options, as well as a large beach area with non-motorized water sports, and three freshwater pools with swim-up bars. The resort's spa offers a full menu of services, including Sky Massages performed in thatched-roof oceanfront huts. *The content of this sponsored article was provided by El Dorado Maroma. Offers and details are subject to change.